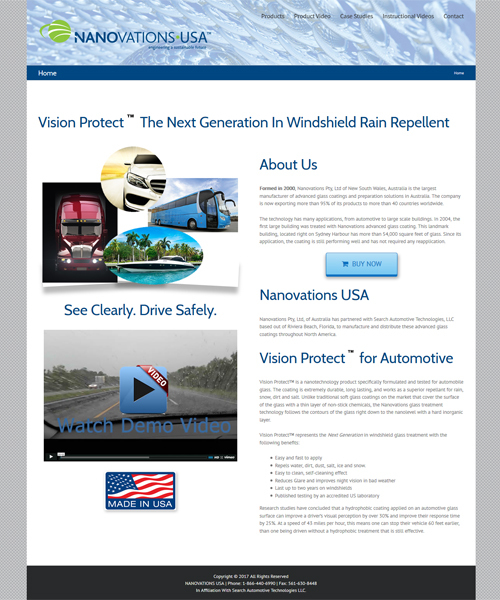 Objective: Nanovations USA is a windshield waterproof based company that needed a strong product web presence in the United States market. Our web design team incorporated a number of solutions in the website such as videos and product slideshows and menu systems. Nanovations USA needed an online presence that could be easily updated and managed to do weekly and monthly updates. The website is fully expandable to encompass new features as the client grows their Windshield and Window based products. Tatem Web Design - We did a full CMS web site using Joomla 3.3.6 for this client's website, email , interactive forms, product videos, product pages. Tatem Web Design currently provides support, manages the web hosting, email, and website stats.